Voilà–above, Keith consulting with Maria (a Catalan, admittedly, but an Australian resident Catalan…)…flanked by David and Beatriz with Christiane at the table’s end; Sonia (hidden in the next row), Eduardo & Martí consulting each other, Almila; Anne-Marie (hidden), Albert, Petra & Blandine; Camille, Christophe, Ingrid & Laia (hidden); Catherine (fetching a cup of tea?) & Christine. 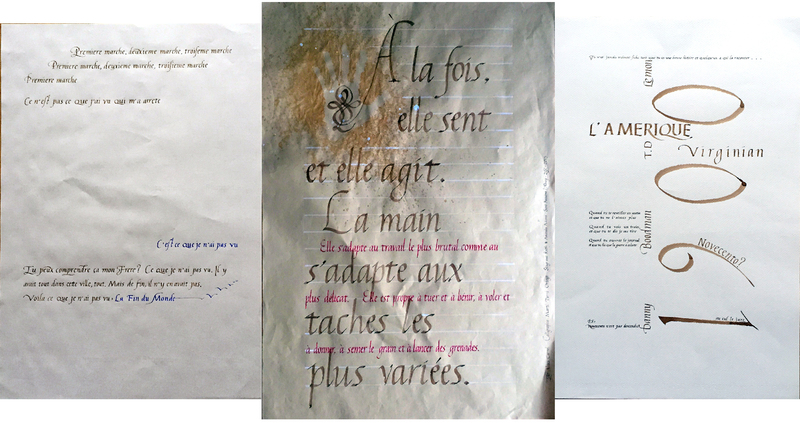 Presenting italic minuscules, simply…and in their place in the long, decorative Histoire de l’Écriture lecture (traces at right) which Keith gives once a year, open to everyone, not just the calligraphy students. Petra came with a special interest in quill-cutting, but sadly no one got close enough with their cameras to show any detail. I shall get out a small tripod and do a photo-essay on quill cutting. Soon. No. I haven’t yet cut the lovely swan quill I received from Mabel at the Laya Point course in July. I think everyone who wanted one got a working quill this week–if you didn’t, please say so! And many thanks to Blandine who brought a bundle of feathers–admittedly some already slightly cut and inky, but perfectly re-cuttable. Merci! If only he’d got a little further with the writing. Still. (Albert has a separate photo-essay on the village and abbey of Saint-Antoine-l’Abbaye.) Thank-you, Albert! Once you have your quill cut, or your “normal” metal pen echauffée & dipped in your brou de noix, it’s time for exercises. Most of these are Maria’s because while I was helping students, she was wisely and professionally taking photos. Possibly the only photos not ©Maria Montes 2015 (used by her kind permission Gràcies, Maria!) are those Maria is in. Which were taken by me…until or unless you, très chers élèves send me your photos! I’m sure you have some! Please? Credit will be gleefully given, I promise! Let us not forget the obligatory reminder of the excellent food. Salads, cheese, fruit…pizza! Made by Andrea, a genuine Italian, this summer! Wonderful! Laia, I don’t have an in-focus image of your Arrighi facsimile looked at straight on–please send me one? Anne-Marie (Brava! ): Laia: whose is this? 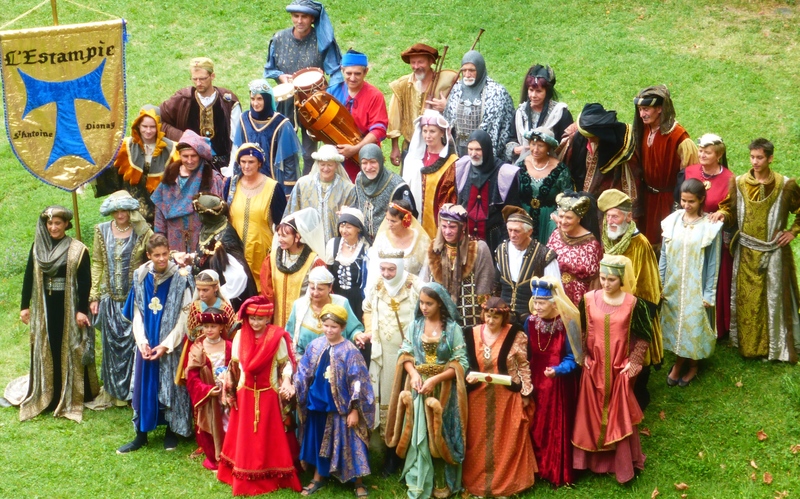 And again, horizontal work; in the top row: David & Maria; in the centre row–is that Ingrid? & Albert; and in the last row Petra & Ingrid (thanks, Albert & Ingrid). Please correct my misattributions! My ageing memory is fading fast. No dogs or cats attended this course; but the “Mediévales” of the Village of Saint-Antoine l’Abbaye occurred during our session–I leave you with some members of the Communauté de l’Arche (de Lanza del Vasto) de Saint-Antoine-l’Abbaye and their children, good citizens of their village and enthusiastic participants in its fêtes. This entry was posted in letterish and tagged Albert-Jan Pool, Almila Yildirim, Amanda Adams, Anne-Marie Biard, Arrighi, Beatriz Ballester, Blandine Arnaud, Cal·ligrafia, Caligrafía, Calligraphie, Calligraphy, Camille Gardette, Catherine Audiat, Christiane Richard, Christine Nodet, Christophe Audiat, Communauté de l'Arche de Saint-Antoine, David Quay, Eduardo Teruel, Ingrid Marquès, Italic, Italique, Jacinthe Tros, Keith Adams, Laia Soler, letterish, Maria Montes, Martí Turró Ortega, Petra Rüth, Saint-Antoine l'Abbaye, Sonia Beroiz, Stage d'Italique. Bookmark the permalink.